This week I've been trying to notice where I say "can't." 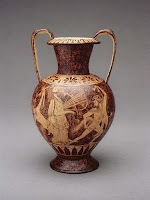 I started out, Monday night, with my realization that when I try to imagine writing more (something I want very much to do), I USUALLY very quickly shut down. I CAN'T write more. My husband, kids, teaching job (you can fill in your own blank) DON'T let me. I CAN'T change this. What happened, to quickly reiterate, was I suddenly saw this as a belief and I began freewriting about how I MIGHT change things. And I came up with a whole list of ways to write more. Another strange CAN'T emerged when I opened a present from my friend, the writer Priscilla Long. She wrote me a nice note ("Congratulations on finishing the novel rewrite! Hurrah! "), and sent me a blank-ish journal. But it wasn't a writing journal. It was an artist's sketchbook, with quotes (blank-ish, not blank) to inspire one to make pictures. What is Priscilla thinking? Is she crazy? I can't start making pictures! The next day, I finally made it over to the campus mailroom (first time this quarter), and discovered a package from Amazon.com -- stuff I'd ordered a month ago and forgotten about. 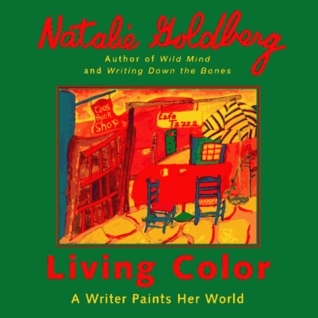 In it was Natalie Goldberg's Living Color, a book that combines Natalie's paintings and drawings with a narrative about how her art evolved. I should add that, among our Monday night students, half are visual artists. It seems the universe is trying to tell me something. I don't know where this is going to lead me. But I can't say CAN'T, so I'm going to find out.